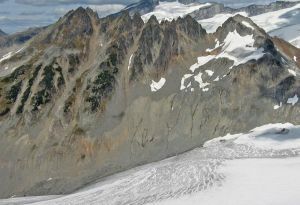 A series of six pinnacles located on the north side of the Phoenix Glacier, between The Sphinx and Guard Mountain. The highest summit is the westernmost one. Most of the pinnacles are easy scrambles. The ususal access on skis across Garibaldi Lake to the Burton Hut. From the hut, ascend the Sphinx Glacier to reach the north side of these pinnacles.